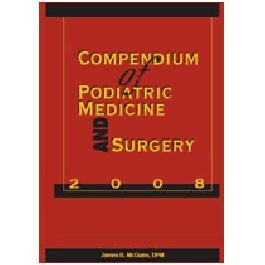 Compendium of Podiatric Medicine and Surgery 2008 is updated on a yearly basis and your subscription is automatic with the purchase of this publication. Subsequent books will be sent to you automatically and billed at the then-current prices. If you do not wish to receive any updates, you must write a letter with your name, company name, address, phone number, and publication, to cancel your subscription. Cancellations may be faxed to 410-494-0515 or mailed to Data Trace Publishing Company at P.O. Box 1239, Brooklandville, MD 21022-9978. Editor-in-Chief: James B. McGuire, D.P.M., P.T., C.Ped., F.A.P.W.C.A. Podiatric medicine is one of the fastest growing branches of the medical profession. Integration into the many disciplines is happening without a conscious effort to insert ourselves into the discussion. The articles chosen by this year’s contributors are representative of medical and surgical disciplines that are changing the knowledge base affecting all practitioners who treat diseases of the lower extremity. Podiatric physicians play a prominent role in the development of new diagnostic and treatment modalities. Evidence is no longer presented to, but by the new leaders in podiatric research and therapy. Wound management, vascular medicine, rheumatic medicine, and trauma are just a few examples of fields that are finding the contribution of podiatric medicine essential to any complete discussion of the care of their patients. There is no more poignant example of the inroads of podiatric medicine into what was once the purvey of allopathic medicine than in the field of wound management. Podiatric physicians play an important role in major wound care societies, such as the American Professional Wound Care Association, the American Academy of Wound Management, and the World Union of Wound Healing Societies. Podiatrists also were instrumental in forming the newest physician-certifying wound organization, the Council for Medical Education and Testing. The podiatric physicians who serve as authors of this text and many others are thought leaders and major contributors to post-graduate wound seminars both nationally and internationally. Industry has recognized many fine podiatric physicians in the field of wound care and has made them an integral part of research, development, and education programs throughout the world. James B. McGuire, D.P.M., P.T., C.Ped., F.A.P.W.C.A. edited by Lesly Robinson, D.P.M. edited by Erika M. Schwartz, D.P.M. edited Sebastien G. Demoiny, D.P.M. edited by Stephen H. Silvani, D.P.M. edited by Raymond R. DiPrimio, D.P.M. edited by John S. Steinberg, D.P.M., Andrew J. Meyr, D.P.M., Rhonda Cornell, D.P.M. edited by Jason A. Piraino, D.P.M.